Each year, if appropriate, the association President selects the individual (or individuals) who will receive this distinguished award. 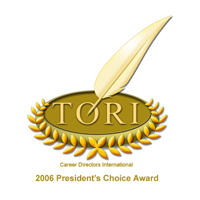 Selection is based on those individuals who have made the most significant contribution to the careers community through their participation and leadership in CDI. 2006: Don Skipper, Career Beginnings, Inc.
2013: None – too many to select. Patricia Duckers – CareerPro Global, Inc.
Damali Curry Edwards – Conscious Recruiting, Inc.